Life at Camp UniStar is simple, rustic, and comfortable. Campers share space in one of our five cabins, Anderson Lodge, or pitch a tent near the Lakeshore. The cabins and lodge feature a common room, simple kitchenette, sleeping rooms for each family, and a bathroom with a tub. Campers bring linens/sleeping bags, blankets and towels. Pillows are provided. The tent area has five tent platforms (bring your own tent, sleeping bags, etc.) with nearby bathrooms, shower, a basic kitchenette, and a screened gazebo. 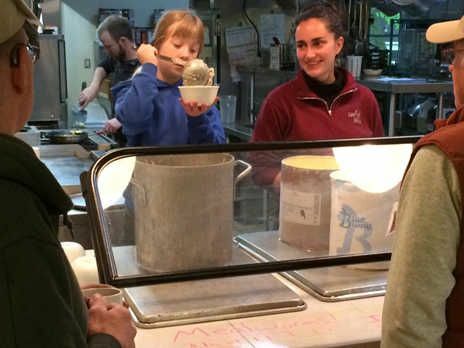 There is a communal dining hall serving three delicious, healthy meals a day. In addition to the regular offerings, at each meal we offer gluten-free baked goods, almond and soy milk, and vegetarian and vegan entrees and desserts. If you have a diet that is very limited, bring some food to supplement the meals camp provides. *Young Adult Discount: For Helping Hands week, the fees apply for 18-35 year-olds: cabin $295, tent $215. Please write “Young Adult” after your name on the Registration Form. Choose more weeks. Your flexibility helps us to accommodate more applicants. Choose weeks early and/or late in the season. The late July and early August weeks are the most requested. Send in your registration form before priority registration ends on March 2, 2019. Registrations received after that date will have fewer weeks to choose from. If all of the weeks you select are oversubscribed as of the priority registration date, you will be placed on a waiting list. If this happens, we will notify you. Deposits are nonrefundable once you have received your registration confirmation in late March. IMPORTANT: Campers drive to SailStar Marina and are ferried from there to camp by boat (see directions). There will be three trips to Camp each Saturday at approximately 2:30, 3:45 and 5:00pm. If you live in the Twin Cities or northern Minnesota please try to take the earlier trips, leaving room later for those coming from farther away. Campers arrive late Saturday afternoon, and leave the following Saturday morning. Private boaters should follow the same schedule. First aid is available at camp. Medical emergencies are taken to the Cass Lake Clinic or North Country Regional Hospital in Bemidji. Canoes, sailboats, and kayaks are available. Campers may also bring their own boats, but no jet skis. A program for children ages 3-11 is available each day 10 a.m. to noon. Parents are responsible for their children at other times. Requests for a second week (not counting Helping Hands Week), may be submitted to the Registrar after March 3rd or to the Camp Director after May 26th (see Contact Information). Program Registration Notes- Please Read! Priority Registration end March 2, 2019 for all program weeks. The Registrar must receive your form with deposit by this date. Postmark does not apply. After March 2nd you may still apply to attend. Please contact the Registrar (until May 25) or the Director (after May 25) to find out which weeks have space available. Make deposit checks payable to Camp UniStar Contact the Registrar to pay deposit by credit card. Registration confirmation letters will be sent in late March. They will include a statement of your balance due, more information about camp, and may include additional information about the program. Your balance will be due by the Friday of the program week you attend. If you require accessible housing of have other special needs, please attach a note. We make every effort to accommodate groups who wish to attend camp together. Pleas see “GROUPS” instructions on the Program instructions form. Please use separate form and deposit for each family. To assist with the planning of housing, those wishing to arrive late or leave early from the Helping Hands Week must enclose a letter with their application stating the dates and times they wish to arrive and leave. Campers who apply for Helping Hands may also apply for another Program week at the same time. Please use a separate registration form and deposit form for the additional week.